The dates for our Autumn Street-O series are now fixed. The events will follow the usual format with Open Orienteering Map maps and lamp posts as controls. The series before Christmas will be on Tuesday nights, with the second series in the New Year reverting to Wednesdays. Full details are here. The first one is on Tue 22 Sep.
We now need some volunteer planners. It is really easy, and there are comprehensive instructions and help available at every stage. Why not try your hand at planning in a low risk environment? Contact Richard to find out more. There has been a brief suspension of the weekly newsletter as the editor is down to one hand following some planned surgery. Hopefully it will be back to normal next week or the week after. Our series of fortnightly urban score events around the streets of Harrogate and Knaresborough will start again on 22 September 2015. Following feedback in the membership survey last year, the series to Christmas will be on Tuesday nights, with the Winter series in the New Year reverting to Wednesdays. This is to give those who cannot make Wednesdays a chance to take part. They will be the usual 45 min score format, starting at or near a pub or home at 6.30pm to allow some optional social. Tue 3 Nov 15 at the Old Spring Well, Harrogate. Registration from 6.15pm for a mass start at 6.30pm. Hope you can join us for a post-race drink in the Old Spring Well. 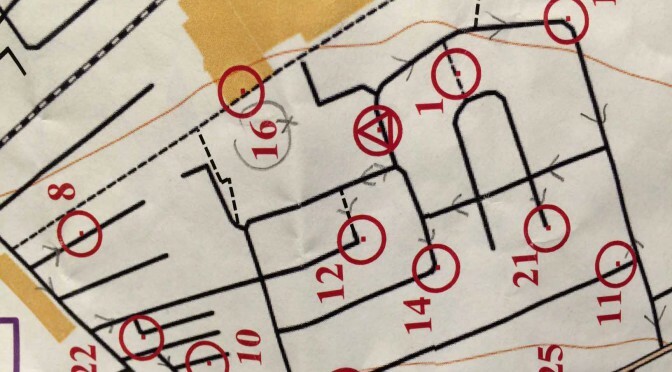 They will be simple events using the well tested format – the maps will be from Open Orienteering Maps – largely black and white representations of the chosen area, with streets marked on as black lines – no buildings to act as identifying features – so you’ll need good contact with the map. All “controls” will be lampposts. Individual lampposts will not be marked on the map – just those chosen as control sites. Every lamppost is marked (somewhere on it!) by the council with a number. Along with the map will be a card to write down the lamppost number when you get there, so bring a pen and a watch! The maps should be on waterproof paper, but a map bag might be needed (though we should have some spares). The cost will be £2 for seniors and £1 for juniors. Unfortunately, as the events are on public roads, juniors (Under 16s) can only take part if they are accompanied by a parent due to BOF insurance requirements. High viz/reflective clothing is required for safety (compulsory for insurance). Don’t forget: pen/pencil, watch, £2, map bag, head torch, hi-viz clothing.